Those who are resourceful enough can keep empty bottles and use them either for storing water, as flower vases or as personalized items for display. Others prefer to display them as they are in the mini bar; after all, they used to contain expensive liquors. But here’s a better way to recycle your empty bottles, especially those which are noticeably attractive. The Satechi Touch USB LED Lamp will change the way you look at those empty containers. U.S. software designer firm, Satechi, recently introduced the Satechi Touch LED Lamp, a bus-powered home appliance that can fit into almost any bottle and can be best placed in the bedroom. 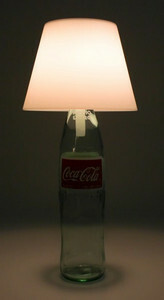 Flaunting a sophisticated design, the white color of this USB table lamp enables it to match with bottles of any color. Change the bottle depending on your mood, or replace it every day just for variety. For as long as the neck of the bottle is wide enough to accommodate the lamp, you can change bottles as many times as you please. To power the lamp, you can connect it to any USB device or wall charger, and it’s compatible with USB 2.0 and SuperSpeed so you don’t have to worry about making it run. Once plugged, just touch the USB LED Lamp and alas! it will open up in a split second. If you’re worried about increasing your electric bill, you’d be glad to know that with the lamp’s use of Green LED Technology, it consumes merely 1.2 watts of power. You won’t even feel it on your bill! The downside, however, is that since it consumes less than 2 watts of power, you can’t expect it to light up all corners of your room. On the other hand, this makes the Touch USB LED lamp the perfect mood light. A bit of a downer for some maybe, but it still is functional and is great to use especially on your bedside. The LED is also rated for 50,000 hours, not bad for a lamp, I would say. Because Satechi’s Touch USB LED Lamp is so lightweight, it can easily be brought from one room to another or one place to the next. Heck, you could even bring it out by your porch or out in the park! The Touch USB LED Lamp is available for $24.99, an affordable price tag for all you innovative, power-saving, and, well, “moody” people. It’s now available on Satechi’s website. This entry was posted in USB Gadgets and tagged DIY Lamp, LED Lamp, Satechi, Touch Lamp, USB Lamp. Bookmark the permalink.